The Ferruginous Pygmy-Owl is a small owl, standing only about 7 inches tall when full grown and weighs between 45-96grams. It has reddish-brown feathers with a cross-barred tail and a whitish belly. The Ferruginous Pygmy-Owl can be found in the US in southern Arizona and southern Texas. Its range extends south through Central and South America. In the desert it can be found in areas with saguaro forests and in wooded river bottoms. The owl mainly feeds on lizards and large insects, but will sometimes eat scorpions, small birds and rodents as well. It mainly hunts at night, but is also active at dusk and dawn. The Ferruginous Pygmy-Owl is considered endangered throughout the US portion of its range. 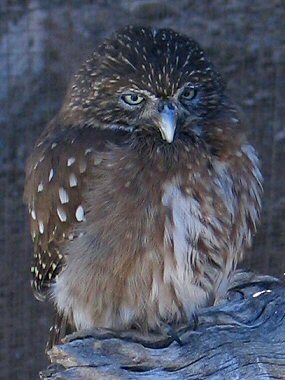 Ferruginous Pygmy-Owls typically live in the hollows of trees and saguaro cacti which they sometimes occupy year after year. The female will lay 3-4 eggs in these hollows, which may not contain any nesting materials. Eggs hatch after about a month, during which time the male will provide food for the female. After the eggs hatch, both parents will provide food for the young owls, which are able to fly about a month after hatching.